Years later, I was animating on Asterix and the Vikings—my first feature film. The quality demanded was higher than anything I had experienced before, and although I worked hard, I was never happy with my animation. I knew I could do better, and I knew what I wanted to achieve, but somehow, I just couldn’t make it happen. be like. Instead, it focused on the practical process of writing. “Start here, then do this, but be careful not to do that”—that’s the kind of advice the book was full of. As I was reading, it struck me that many of these process tips may also be applicable in animation. Replace a few writing terms with animation terms, and you get something you can use. I started applying these tips in my work, and amazingly, it turned out to be just the kind of advice I needed. Not only did it help me overcome my anxieties, but it also improved my actual animation! That experience left a deep and long-lasting impression on me. A book about writing helped me become a better animator; what did that mean? Would it also be helpful in other creative fields? Could there be an approach that would work for every kind of creative field? I had to figure it out. Over the next decade or so, I spent a lot of time studying the creative process in different art forms. I looked into writing, web design, painting, architecture, music, game design, sculpting, and of course, animation. I also tried to be constantly aware of my own process. Which strategies proved consistently helpful? What were the common pitfalls? about a sense of control, while embracing the inherently chaotic nature of creativity. I started implementing these methods—not only in my own work but also in managing creative teams, directing large projects, teaching students, and coaching fellow artists. 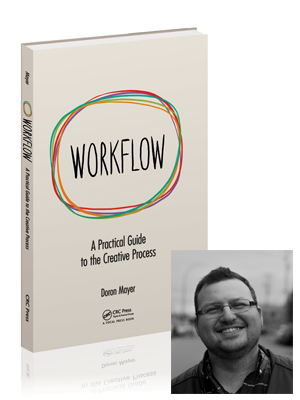 Over and over again, the workflow proved to be helpful. This book is my answer to the question I asked my supervisor at the beginning of my career. It is the book I would have loved to have read back then; it would have saved me years of pain and frustration. Whatever creative field you’re in, I hope these ideas will help you work with confidence and flow-and most importantly, enjoy the process. Previous Previous post: Am I Sabotaging My Creative Flow?